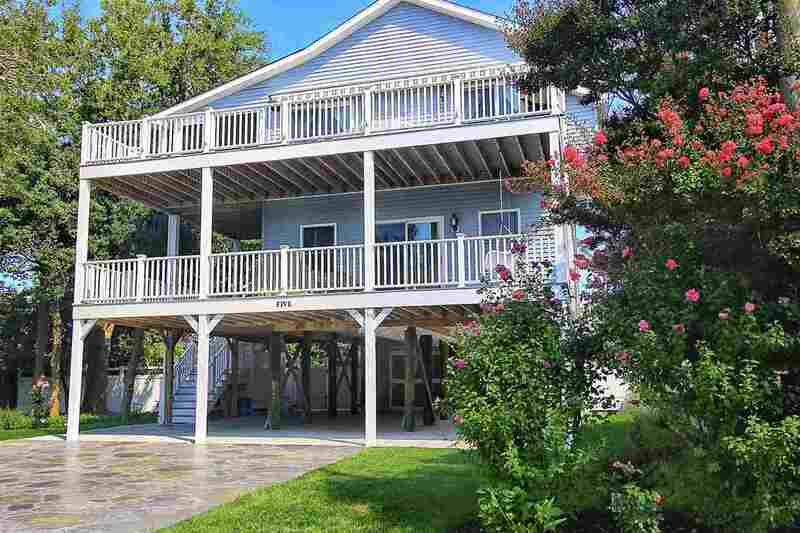 LOCATED JUST 3 HOUSES TO THE DELAWARE BAY WITH VIEWS AND AN IN GROUND SWIMMING POOL. This upside down home was built in 2013 on pilings to provide water views from the top floor. The top floor offers an open living room, kitchen with whirlpool stainless steel appliances, beautiful cabinetry and granite counter tops, dining area with gas fireplace, 1 bedroom, full bathroom enclosed screened porch and a wrap around deck with views. The second floor offers a beautiful master bedroom with full bathroom and walk in closets, 2 additional bedrooms with a full bathroom and laundry area and a wrap around deck. This home sits on an 80x100 lot and provides parking for at least 6 cars with concrete and pressed concrete driveway, outdoor shower, in ground Anthony Sylvan Gunite swimming pool with pressed concrete patio, storage unit, outdoor laundry area with 1/2 bath and a lovely landscaped yard with in ground sprinkler system. This home also features retractable awning to top front deck. Simply a lovely home! Furniture is negotiable. Home comes with the remainder 5yr home warranty. Owner has survey on file. Call today for showing!